A tale rich in characters and magic, Meddler not only delivers joy but also tragedy. This is the story of a creature bound by a fantastic mind that can predict, pre-empt and ultimately bring about futures, by meddling. A group of people, brought together through hardship and scourge, come to know him as their own, and the gothic town of Hares Folly will never be the same. This story is abundant with humour but also with sorrow, and has taken the form of a fairy tale, but purely for adults, and allows us a little magic that, perhaps, is lost for us when we inevitably take on responsibility. I was given this ARC by the author and all opinions in this review are my own and completely unbiased. Well who doesn’t love a good fairytale, right!? The cover alone had me captivated and I was thrilled to have the opportunity to read this book! This is by no means a fast-paced story. It can’t be, as the pace is part of the journey and needs time to build. I enjoyed it, but have to say – in order to grasp the fully experience and enjoyment of this book you have to dedicate the time as the language used is not one that can be rushed. Concentration is a must! I loved the mash up of goth, philosophy and fantismal fairytale – there is a poetic mysticism that really leaves a feeling of euphoria when the reader reaches the end if this book. To me, it had a Tim Burton feel to it (and I adore Tim Burton!) and I could really see this turning into something similar to A Nightmare Before Christmas on the big screen! There were so many characters that grabbed my attention but the few that stood out included Reuben – a companion and guide; he is almost like the bond that holds everyone and everything together. He is insightful, witty, clever and strong. We learn so much about him as the story unfolds that at times, for me, he “stole the show”! I also ADORED the witches!!! Especially Niamh and Wilhelmina – they made me fear their actions and the power they had …wow! Both were truly magnificent! And of course, The Meddler! I don’t really have to describe his role as the name itself gives that away! There is a child-like mentality to this character, I could almost see the glint in his eye when he was up to his tricks. But having Reuben as his companion grounded him. I can tell you, I was well and truly enthralled! It is hard to describe the feelings this book evokes as I suspect it may be different for everyone who reads it! It is just that type of book – and I love that! For me, I was curious, excited, sad at times but well and truly enraptured by the story, the words and the characters. Do I recommend this book? Hell yeah, I do! Although I classed it as non-crime – there is this element within the story too! So win/win as far as I am concerned! 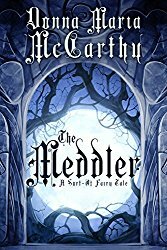 If you want to escape from reality, venture into something magical, full of wit and charm – click the link below and introduce yourself to The Meddler! This entry was posted in Book Reviews, Non Crime Books by crimebookjunkie. Bookmark the permalink.